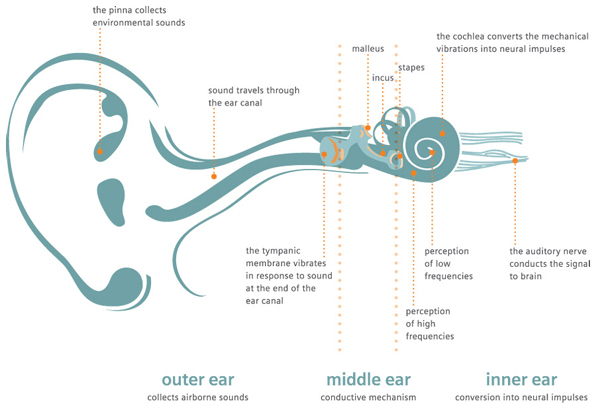 The human auditory system can be divided into four primary parts. Each of these parts has a specific function to enable sound to be interpreted by the brain to give it meaning which we can understand. The outer ear is the portion most easily identified by its visibility outside the head, but also consists of the ear canal going into the skull. The visible cartilage portion is referred to as the auricle, or pinna. The outer portion of the ear canal has cerumen glands and hair follicles used to excrete dead skin and other debris which would otherwise accumulate in the canal. The shape of the pinna collects the sound waves as they travel through the air and funnels them through the external auditory (ear) canal. Simply put, these sound waves are vibrations of air molecules moving through space bouncing off each other. Based on the patterns of displacement of these molecules, sounds can be classified as having different frequencies and intensities, which are perceived as pitch and loudness by the individual listening to it. Providing there is no blockage in the ear canal (e.g. impacted earwax), the sound travels to the tympanic membrane (TM) which is also known as the eardrum. The TM is a flexible membrane which is very sensitive to the vibrations caused by the sound travelling through the air. Attached to the TM is the malleolus, which is the first of three tiny ossicles (bones) which span the entire middle ear. The incus and the stapes complete the ossicular chain, with the stapes connecting to the oval window of the inner ear. Also known as the hammer, the anvil, and the stirrup, these bones act as levers to intensify the energy of the sound waves bouncing into the TM. The efficient concentration of this mechanical energy is then delivered to the oval window of the inner ear and then converted to hydraulic energy. The suspension of these middle ear bones is accomplished with ligaments and muscles, and it is imperative that this delicate infrastructure has good integrity to effectively accomplish the task which is demanded of it. Any disarticulation, stiffening or other malfunction of this mechanism could cause a potentially significant hearing loss. A hearing loss caused at any point up to the end of the stapes is called a conductive hearing loss, and is often medically treatable. It is important that your hearing professional identifies a conductive hearing loss and makes the necessary medical referral. Another noteworthy contributor to proper middle ear function is the Eustachian tube. Since the middle ear is a cavity with a mucosal lining, it is important that the fluid produced in the middle ear is able to drain properly and that proper pressure in the middle ear is maintained. This is accomplished by the involuntary opening and closing of the Eustachian tube when an individual swallows. When the Eustachian tube is not functioning properly, fluid and pressure can build up in the middle ear, causing discomfort and hearing loss. This phenomenon happens frequently in children and explains the purpose of tubes placed in the TM. The inner ear is another set of cavities in the skull which consists of the cochlea and the vestibular system. The vestibular system consists of three semi-circular canals and two larger divisions and is responsible for balance and equilibrium. These fluid filled passages detect movement and velocity of the head to give the person the proper orientation regardless of position and movement. The signals are sent to the brain via the vestibular nerve which is a segment of the VIIIth cranial nerve. While not directly responsible for hearing, the vestibular system is part of the inner ear. The cochlea is a snail shaped cavity which begins at the oval window where the stapes is connected. This fluid filled cavity acts like a hydraulic system as pressure is applied by the stapes and displaces the fluid in a pulsating-like manner. Based on the intensity and frequency of the sound, various membranes and hair cells in the cochlea are stimulated by the pressure of the displaced fluid. This process converts the hydraulic energy into an electrical signal which is then transferred to the brainstem via the VIIIth cranial nerve. When these hair cells get damaged or destroyed, the individual will experience hearing loss. Since the use of hearing aids changes the sound pressure, it also changes the displacement of the inner ear fluid, thus stimulating different hair cells, which in turn sends an otherwise absent signal to the brain for processing. The central auditory pathways act similar to a set of circuits. The nerves attached to the cochlea carry the electrically produced signals to the brainstem. From this point the neural pathway delivers the signal to the cerebral cortex at the temporal lobe of the brain. Much of the information received from the right ear is transferred to the left temporal lobe of the brain, and the information from the left ear is transferred to the right temporal lobe of the brain. This transferring of information helps the brain process tonal differences from each ear, which is then deciphered by the brain to enhance the quality of the sound signal and give it more meaning. When one ear is deaf or unaided (in the hard of hearing patient), the ability to combine the dual signals is lost; and benefits such as tonal quality and sound localization are compromised. Imagine a V-8 automobile running on only four cylinders. While the car may still run, the performance would be significantly reduced.